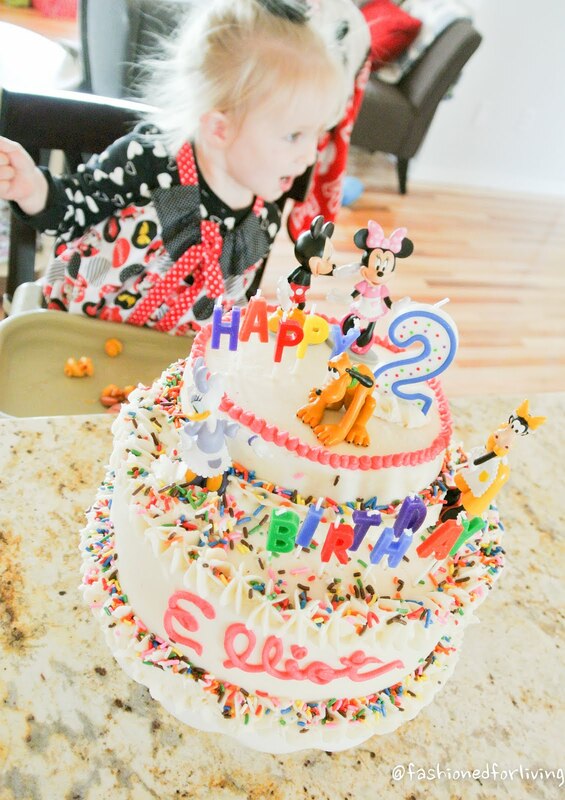 Sharing all the details of my baby girl's (Elliot) 2nd Mickey Mouse themed birthday party! 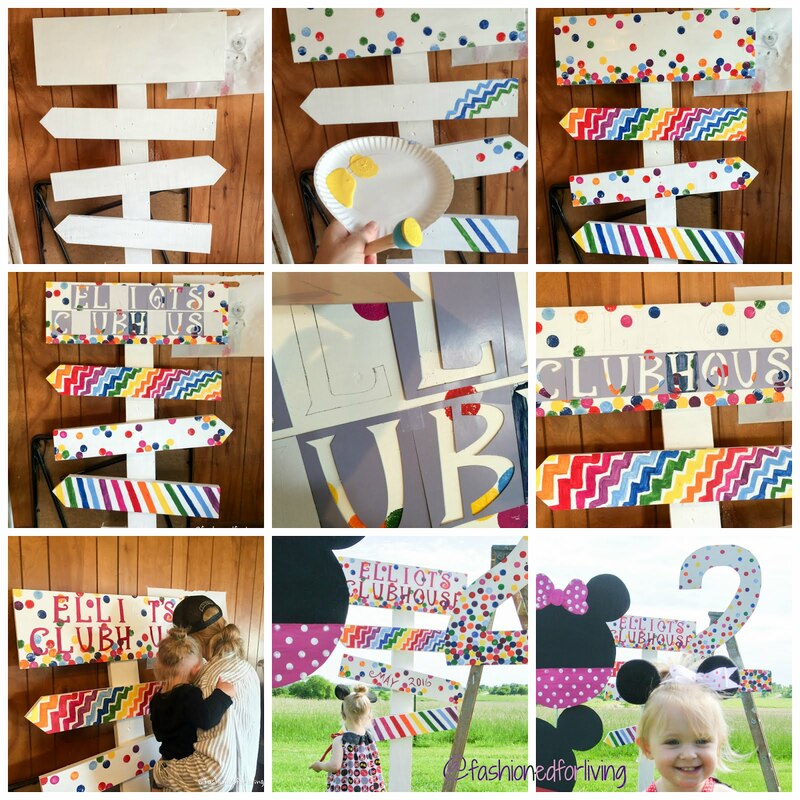 WOW!, Picking a theme that is more common than what we typically go with did make this party SO much easier to put together! 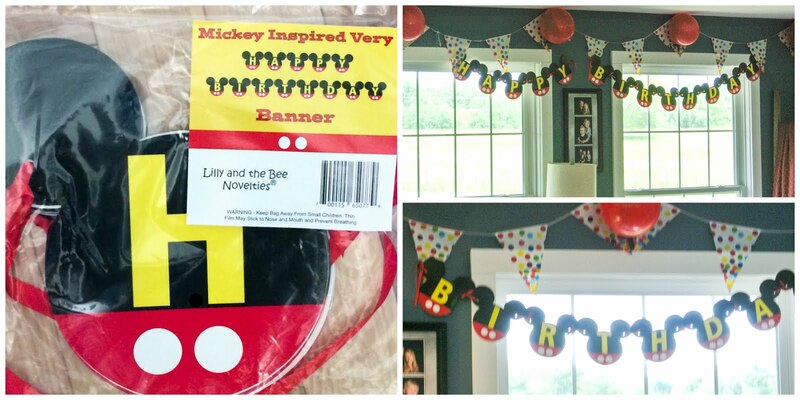 Normally I pretty much start from scratch with the decorations, but Elliot loves Mickey so thats what we went with! As I had mentioned in my Little Blue Truck themed birthday(click here) post it has become our tradition to take pictures with the birthday boy or girl. We cherish these photos! It ended up being a particularly windy day....aka my husband has everything braced and anchored down for gail force winds!! If I had to do over again I would change up the arrangement slightly, but nonetheless it turned out so CUTE!!! 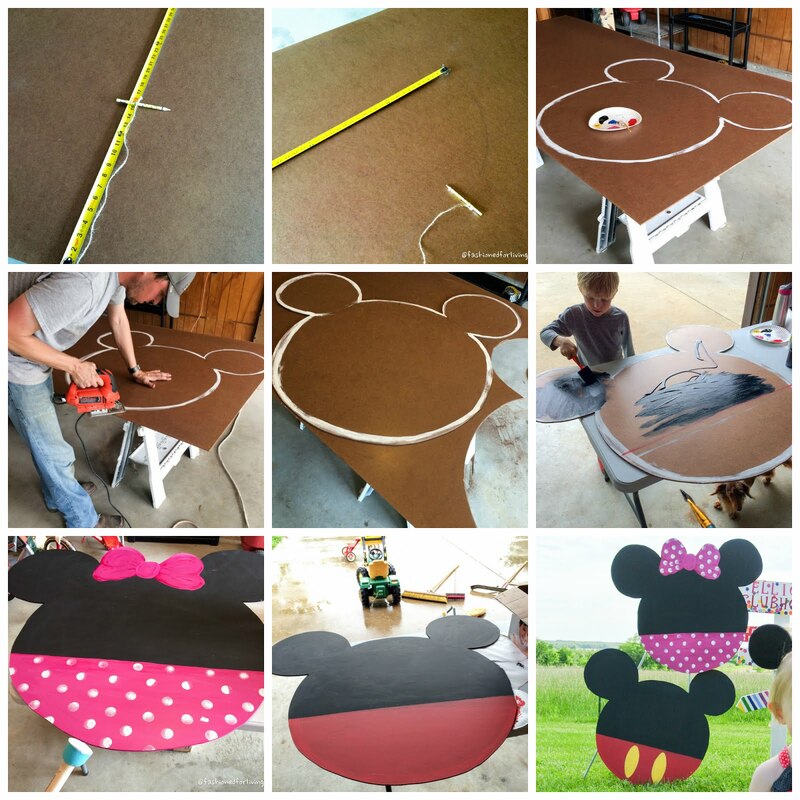 We used MDF board to create the Mickey/Minnie cut outs. It's super inexpensive and is light weight. Perfect for suspending in the air. Saw horses work great for holding the board up and for ease of cutting out shapes. 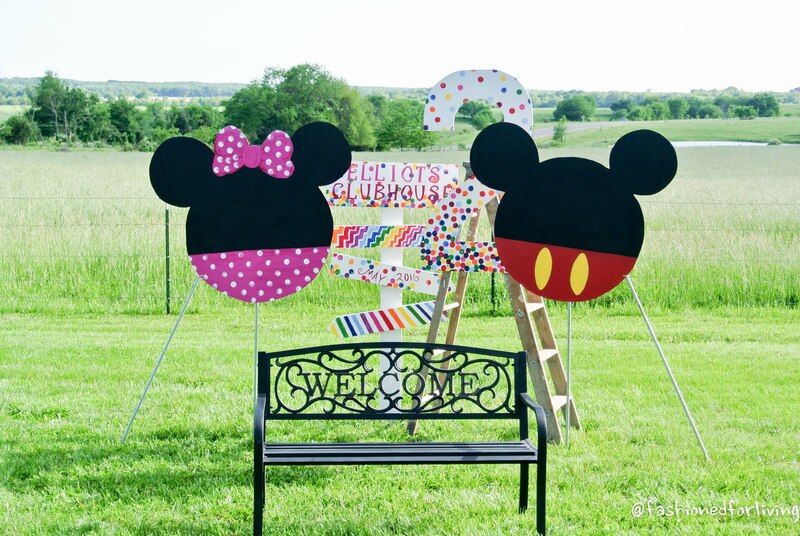 I loved the idea and simplicity of having the abstract head cut outs of Mickey and Minnie be apart of the backdrop, or "Toodles" as my son referred to them. I tried to take pictures of each step, but I tend to "wing it" as I go. I measured the width of the board and guesstimated the circumference I would need to fit two heads on one board. I then used a string tied to a pencil to work as a compass, and again guesstimated the radius of the circle and held my string down in the middle to draw a perfect (pretty close) circle. I then drew two smaller circles around a quarter of the size of the large circle to make the ears. I'm more artsy/visual and my husband is more mathematical/technical (which is probably why we make a good team! )...he said it looks good, but I wanted to SEE it. I painted the white outline to get a good visual on the proportions, and it did make it easier to cut out. Once the shape was cut out I placed it on top of the unused board and traced to make the 2nd head! I free handed a bow for Minnie before cutting. My son and I painted the top portion black on each and the bottom half according to Minnie/Mickey. 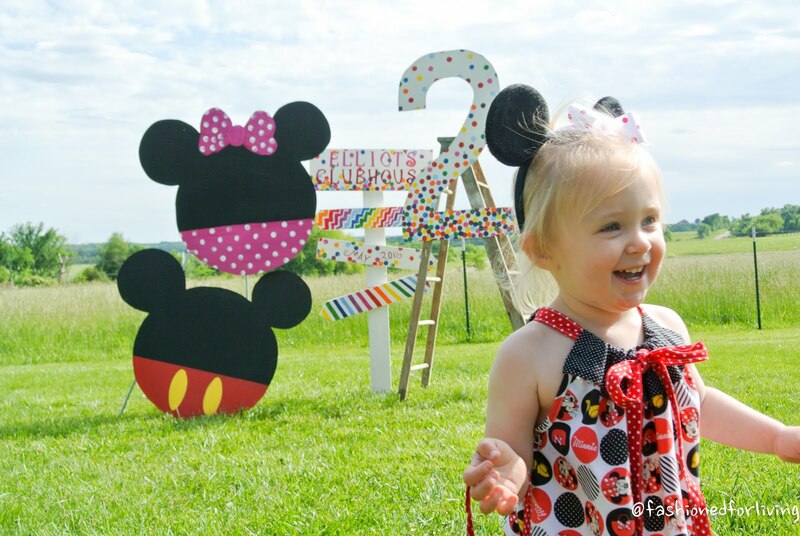 I used a large craft stencil stamper to make the white polka dots for Minnie. My husbanded freehanded Mickey's yellow buttons. 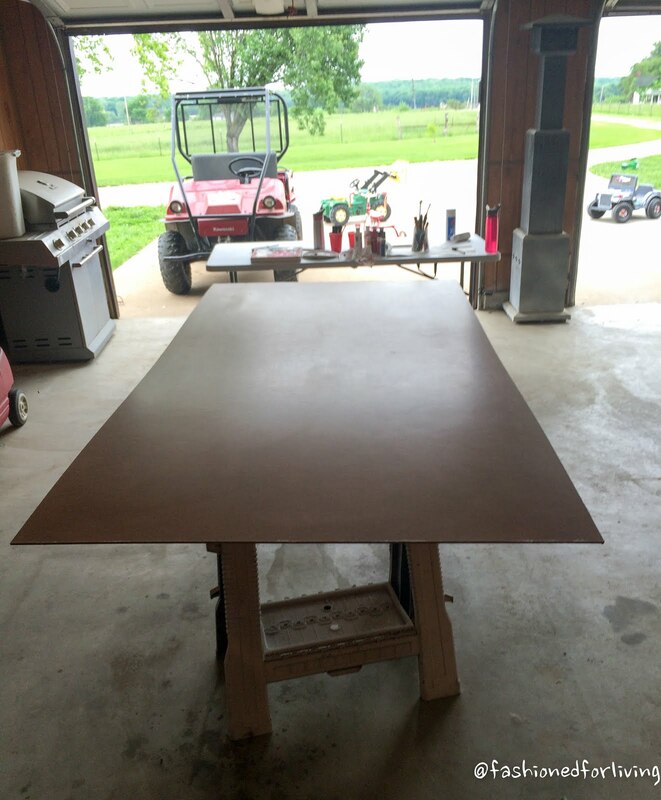 You could easily use poster board or cardboard to make something similar if the MDF seems intimidating. We used conduit pipe to suspend the head cut outs, and attached them with U clips and screws. Elliot's clubhouse sign was recycled from my son's birthday from a couple years back. It was built by my husband using scrap wood. I painted it white using house primer paint. Then I took inspiration from some of the store bought decorations I had purchased and painted zig zags, polka dots, and lines in primary colors. I painted each portion of it with one color at a time, then moved to the next color. I only had one of circle stamp foam brush, so I washed that baby a lot! After all of the color work was completed I used stencils to write "Elliot's Clubhouse". If I needed the same letter more than once I place a stencil of an unneeded letter to serve as a placeholder and to insure all the letters had the same spacing. Then I simply filled in the letters with paint. I free handed the month and year. I used a piece of scrap MDF board and free handed the giant 2, painted it white with the same house primer paint, added polka dots, and then my husband attached it to an old ladder. We used a bench from our front porch for people to sit on with the birthday girl for pictures. I purchased flag/pennant banners and tissue pom garlands from Dollar Tree. I hung the tissue pom garland in the entryway over the staircase using thumbtacks. I tacked it the first pom on each garland as close to the ceiling as possible to hide the tack. I used the pennant garland to hang along the staircase railing and along the ceiling. Along the ceiling I used tacks right at the seam at every fourth flag, and used a ballon to hide the tack and add to the decoration. My husband was worried about adding holes to our walls, but by tacking the garland right at the seam of the wall and ceiling the evidence left behind was minimal to none at all. The "Happy Birthday" garland was also purchased from Dollar Tree! Just A BUCK! Can't beat that! 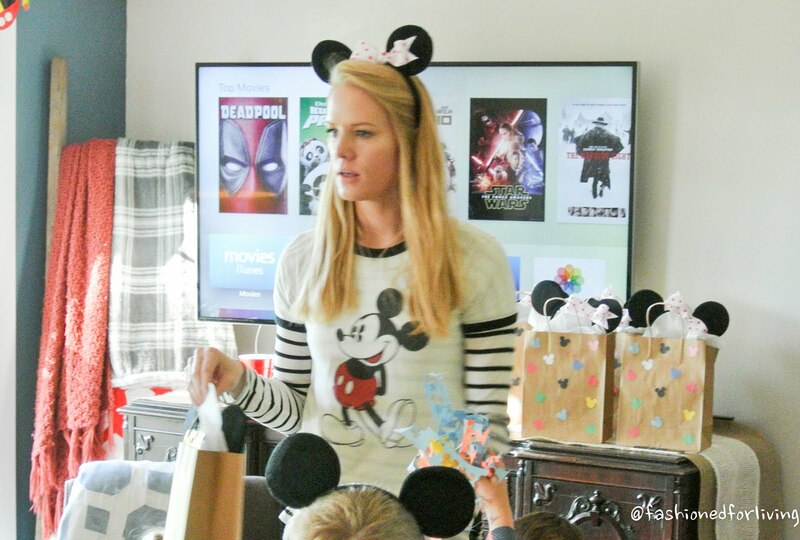 The Mickey Mouse head banner was purchase on Amazon, and I placed it over where we would be sitting to open presents. The quality of this banner is nice, but if you had the time could easily be duplicated! I apologize because these are the only pictures we captured of the tables and decorations!! Bummer! I used brown freezer paper to cover the tables, placemats, Mickey Mouse head confetti, and twisted streamers. 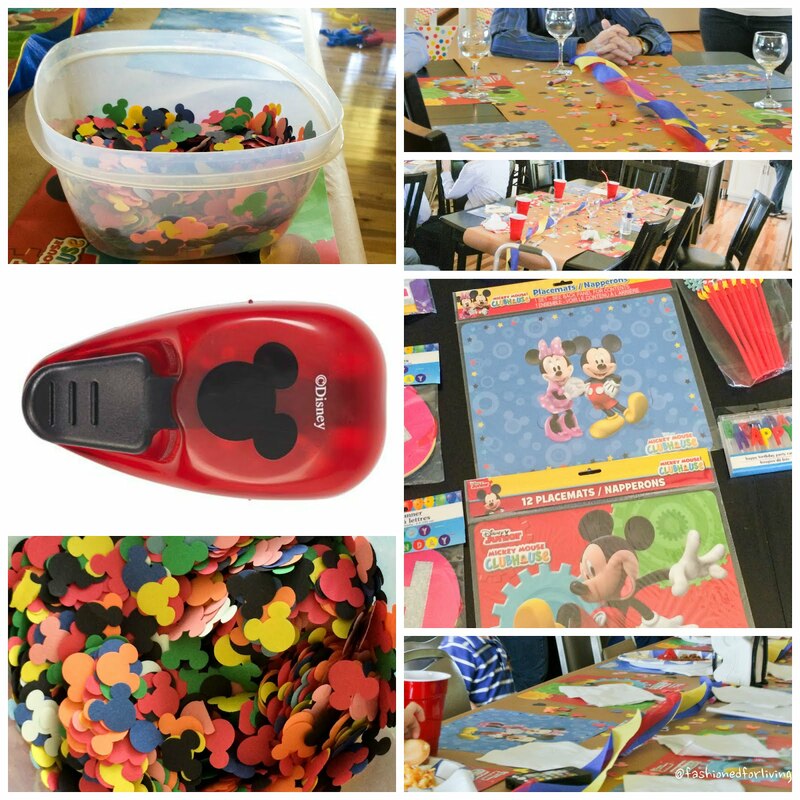 The Mickey Mouse confetti was so fun and easy to make!! I purchased the punch(CLICK HERE) from Amazon, and used different color construction paper...I though my son would enjoy this project, but after the first couple of punches he was over it!! My husband was away with work the week prior to the party, so a couple nights I poured myself a glass of wine and sat in bed making these!! I found it therapeutic! I alternated the placemats and used a glue stick just on the corners to hold them in place. The streamers I twisted and attache with a piece of duck tape under each end of the table. 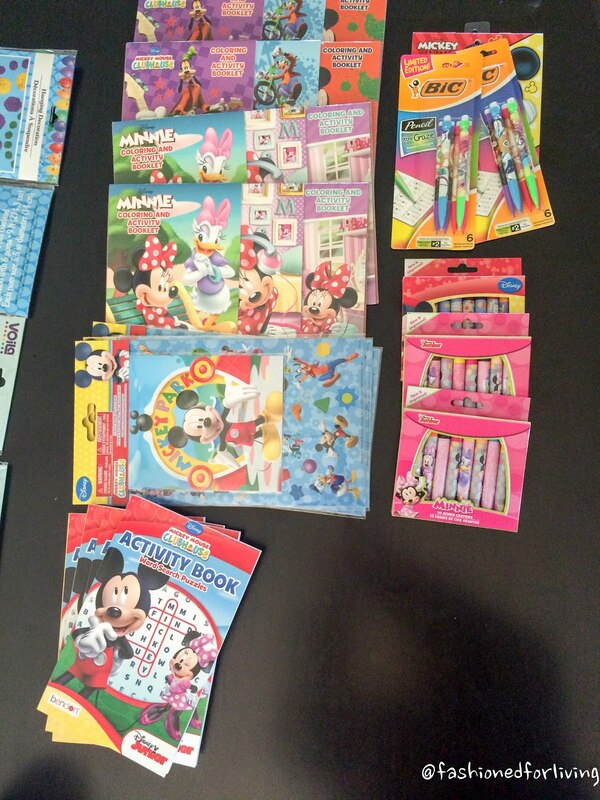 I also placed Mickey and Minnie crayons on the table for drawing on the brown paper table cloths. These are super simple to make and the kiddos love them! I used 2 red velvet box mix and followed the directions to make the 24ish cupcakes. I like full cupcakes and fill the tins almost to the top...and at least 2 or 3 were sampled prior! I think the secret to box mix cake (or any baked goods) is not to over cook them! !...no shame here! I do make homemade icing. I used THIS (click here) recipe for the first time and it is the BOMB! Several people commented on how much they liked the icing! To make the heads you need regular size Oreos and snack size Oreos. I believe it took 5 of the snack packs to make the 24 heads. Some of the snack size Oreos will be broken. OK, SO I USED TOOTHPICKS. 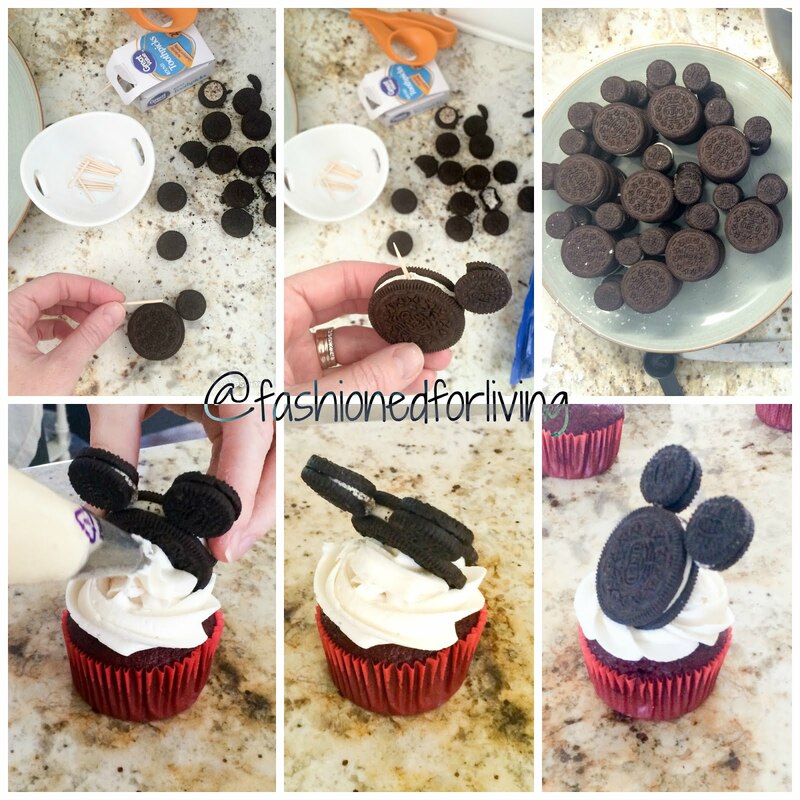 This was definitely the easy way out of trying to attach with icing or some other method. I cut the toothpick and half, and used each piece to attach a snack size on each side to a regular size Oreo. When we were passing out the cake and ice cream we told everyone to be sure and remove the toothpicks. I think this worked out fine and made the cupcakes sturdy especially when making ahead of time. I probably would try another method if making for a school function. I iced the cupcakes and put a dab of extra icing on the back of the Oreo to help hold it up when putting the cupcake. I used white box mix cake and made 2 - 9 inch rounds and one 6 inch round for the very top circle. Make sure and trim the tops of the cake to make a nice flat surface for stacking. All of the candles are from the Dollar Tree and the figures my son had in his toy box. I used the sprinkles to cover my less than perfect icing skills and to add color! Simple but CUTE, and very inexpensive!! Sorry for the blurry picture, but this is the best pic I have of the favors! I used brown paper bags and glued the Mickey head punches on the front....Well, my husband did. I would have just randomly pasted them on, but he followed the exact same pattern on each bag. To each their own! I purchased these(CLICK HERE) mouse ear headbands, and my mom made bows for the girls and hot glued them to the top. 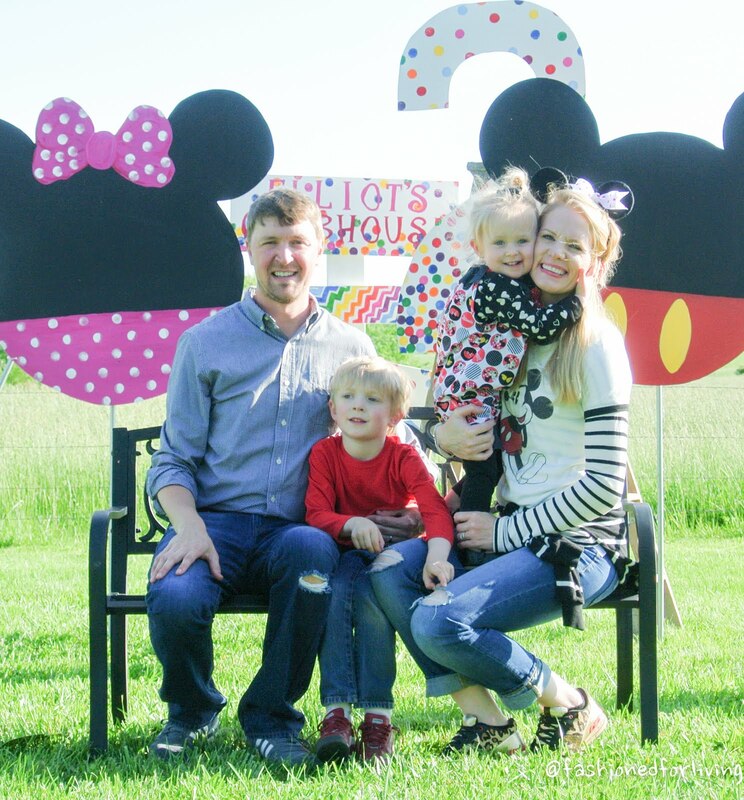 The kiddos LOVED the mouse ears and wore them the entire party. I have to admit I was a little surprised by it, but then again I enjoyed wearing my ears as well!! 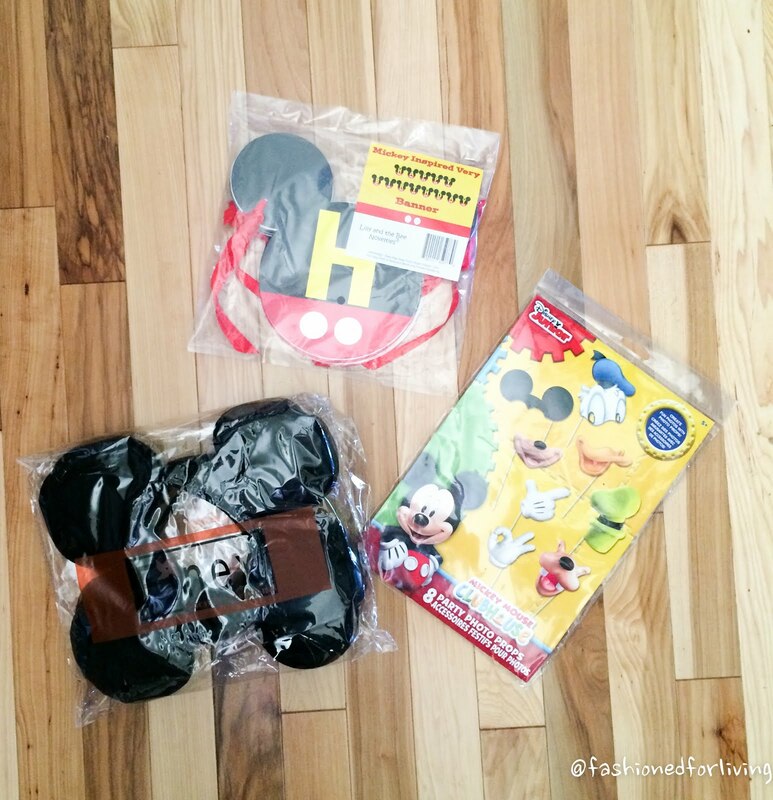 I also used a mixture of these items in each bag which are all from the Dollar Tree. We used the backdrop to have a 2 year photo shoot the next day, which my daughter thought was completely hilarious and ran around it pretty much the entire time I was trying to take pictures. I did manage get a couple that capture her personality to a T! I feel like most people don't give themselves enough credit when trying to create or be crafty. Half or maybe more of the battle is just trying!! I often hear "I could never do that"...really, but have you tried? You might just surprise yourself what you're capable of! As always, I would love to hear from you and/or answer any questions you may have!! Almost forgot...I purchased this(click HERE) Mickey Mouse themed photo props and kept them in a small tin bucket by where we were taking pictures. The kiddos and adults got a kick out of them and help to aid in smiles for the pictures!